As a general rule, I don’t fall for recipes with cutesy names. But when I kept stumbling across a recipe for “Yum Yum Cake,” in my old cookbooks, I decided that perhaps there was something more to the recipe than a cute name and ought to give it a try. The method for making this cake is really quite fascinating. 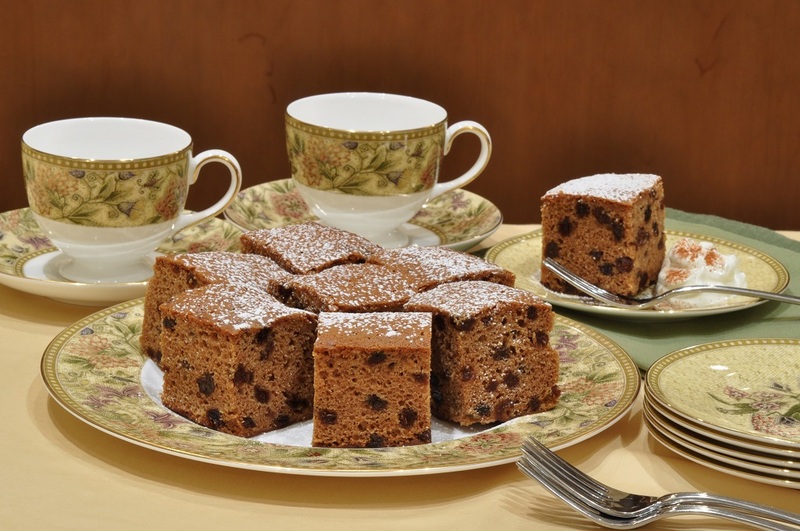 It is a spice cake, made with raisins, and contains no eggs or milk. 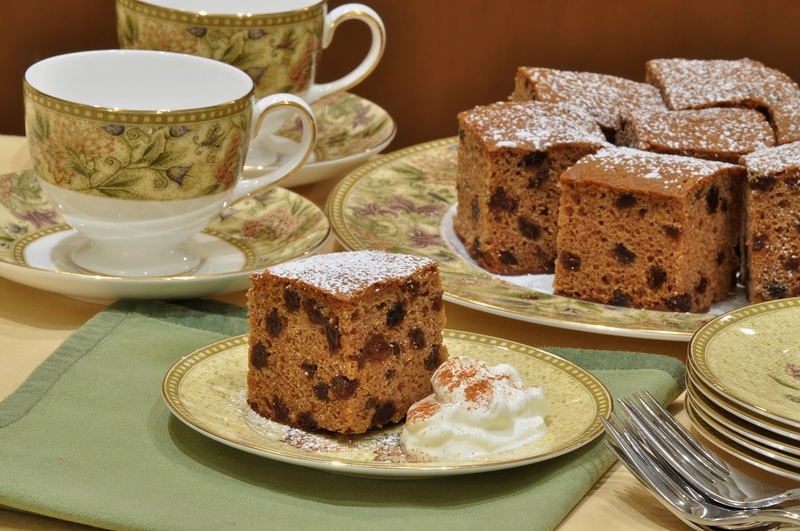 The raisins get boiled in a syrup of sugar, water, and butter instead, and then the mixture is allowed to cool before mixing in flour, spices, and leavening agents. The resulting cake bakes up with a tender, moist crumb inside, and a delicious, thick dark-gold crust on the outside. It is a sturdy, old-fashioned cake, a bit dense and very flavourful. 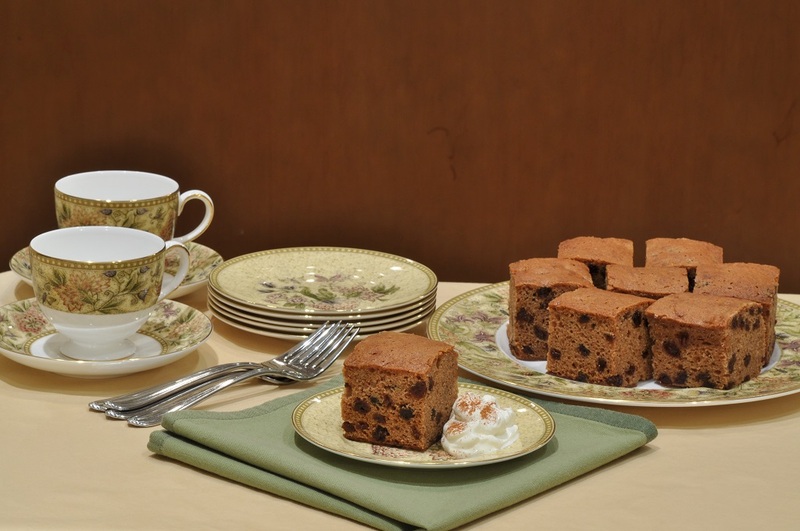 In the old cookbooks, the cake was usually referred to as a “cheap” or “economical” fruitcake, as the absence of eggs and dairy (the older versions of the recipe called for using lard, not butter) made it a luxury that could be afforded more easily. Nowadays, we probably aren’t worrying about the cost of milk when we’re picking out a cake recipe to make, but food allergies and the popularity of the vegan diet have given us a new reason to find this a useful recipe. Of course, my version isn’t vegan, since I insist upon using butter in my cakes, but you could easily substitute a vegetable shortening and still get a good result. (Or you can use lard and be truly authentic, although certainly not vegan!) The truth is, what with all the spices and the brown sugar and raisins, you really wouldn’t miss the butter flavour that much at all. The cake certainly is “yummy,” although I still feel that the name is silly. However, it came in very handy for this month’s Alphabakes challenge, hosted by Ros of The More Than Occasional Baker, as the letter selected was “Y.” We’ve been going through some tough letters in the challenge recently, which is organized by Ros and Caroline of Caroline Makes (they host on alternating months). Last month was “X”—pretty tricky—and “Z” is due to come up any time now. What a shame it isn’t zucchini season. I fancy we all would have been doubly creative in trying to use up this famously prolific crop. As it is, I suppose we’ll just have to really put on our thinking caps. It should be a very interesting round-up. I’ve already got an idea, which, I’m sorry to say, involves yet another cutesy name. But, like Yum Yum Cake, it has more good points than just a cute title. This cake was one of the ninety vintage Bucks County recipes featured in my newly-released cookbook, Potato Pie and Cherry Pickle. If you liked this recipe, you might also enjoy the book! You can take a peek inside on its Amazon page. 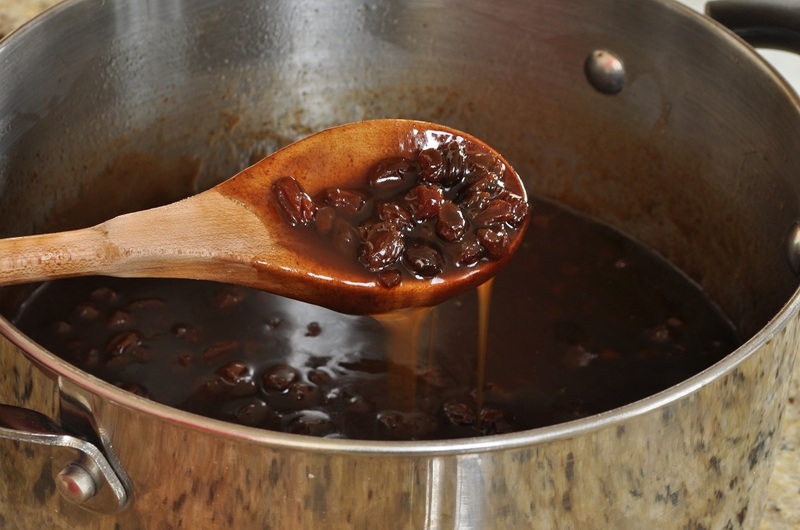 Combine the sugar, cold water, raisins, and butter in a large saucepan over medium-high heat. Bring to a boil and let the mixture bubble away for five minutes, stirring occasionally. Remove the pan from the heat and let the mixture cool to room temperature, at least one hour. Preheat the oven to 325°F. Line an 8-inch square pan with parchment paper and grease the sides of the pan. In a large bowl, sift together the flour, spices, and baking powder. Dissolve the baking soda in the teaspoon of hot water, and stir it into the cooled raisin mixture. 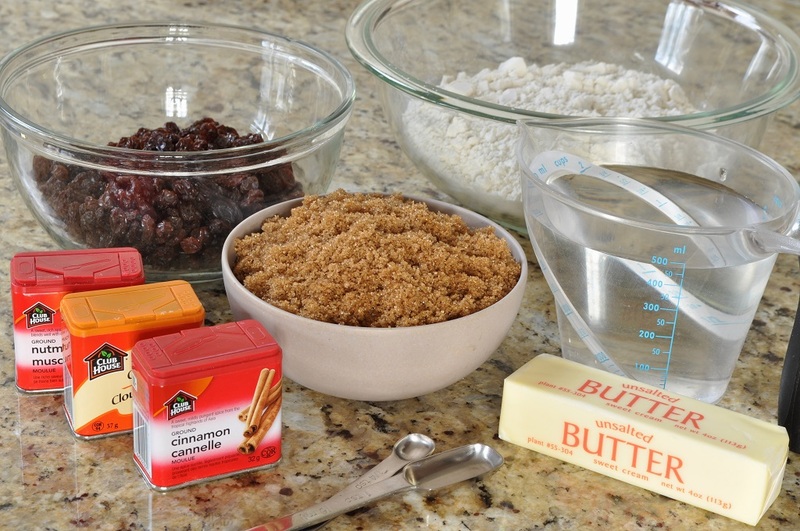 Add the sifted dry ingredients to the raisin mixture and stir until the batter is smooth. 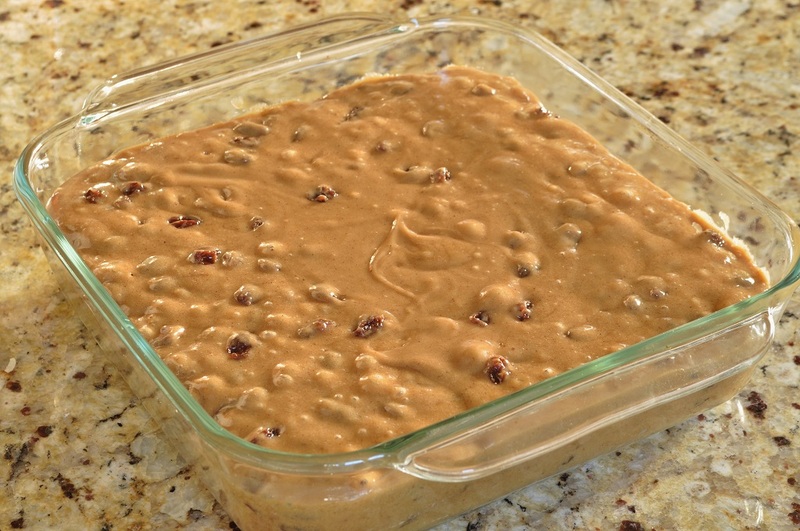 Pour batter into the prepared pan and smooth the top with a spatula. Bake until a toothpick inserted into the center of the cake test clean, 1 hour and 10 to 20 minutes. Cool in pan before cutting into squares. This recipe is almost identical to one used by my mother seventy plus years ago, during World War ll. Rationing was in effect and certain items were hard to come by for frivolous things like desserts. There were no eggs,less sugar and shortening instead of butter. I made the cake many times when my kids were young. My mom iced it with either a thin maple or coffee glaze. Loved it! Think I will make it this weekend! Thanks for the memory. Thanks for sharing the story with me. I love to hear about the history of recipes. I think a coffee glaze would be absolutely delicious on this cake! I hope you do make it this weekend–and enjoy every bite! What a brilliant entry for AlphaBakes! I can imagine this would be very popular in times of war and famine. It will also make a great vegan cake with some adaptation. Thanks, Ros! It certainly is a frugal cake, but also utterly delicious–no deprivation at all. I’m going to pass this one onto my mum – I think she will really like it though she might have a hard time keeping my dad away from the cake tin! Yes, good luck keeping anyone away from this cake–the aroma of the spices is absolutely intoxicating! I would love to try this cake, it looks delicious and very similar to the kind of thing my mother or grandmother would have made (back in the 1950’s!). I made something similar called a war cake which used lard instead of butter, making it even more frugal for wartime when food was rationed. It sank horribly but tasted lovely! Yours looks infinitely better and very tempting. Thanks for the recipe! I’m glad to have posted a recipe that inspires memories. I love the way a recipe can transmit history down through generations! this is the same cake my mom used to make. thank you for sharing it. I will now be able to make one in her memory. I am very glad to have been able to help you find a cherished recipe. Many people have responded to this recipe with similar nostalgia–I always love to hear the stories!